I think that many times we struggle with color combinations, don’t we? The battle between photos and the theme? We have a Christmas page to do, but the kids didn’t understand the color coordinating that needs to occur so you can scrap the event and they wore orange??? I say, why fight it??? Who says we have to go with the norm? And when you can cut your own designs? You are the master of your creation! Check out what our darling Miss Laura did on her Halloween page . . . soooooo love this!!!! It has all the elements of Halloween, but not a hint of orange. What a great combination of colors and shapes . . . works perfectly with the photos! When I scrapbook our Halloween photos, I hardly ever use the traditional Halloween colors that most Halloween products are made in. My girls never pick costumes in black and orange colors, or even purple, which is another big color that I see in Halloween collections. So I love that I can use my Silhouette and Kerri’s shapes, to design my layout around the colors that match what costumes my girls picked out each year. I cut the grunge diamond foundation, from aqua pattern paper, to match the aqua in my girl’s costumes. I cut this shape twice, both at 6 inches square, and then pieced them together to cover one side of the layout. I wanted the spider web border to go the full height of my layout (12 inches), but didn’t want it to be too wide, since that side of the design was only 6 inches wide. So I cut the spider web a bit smaller (about 8 inches tall), and then simply cut it into two pieces to go above and below the photos. 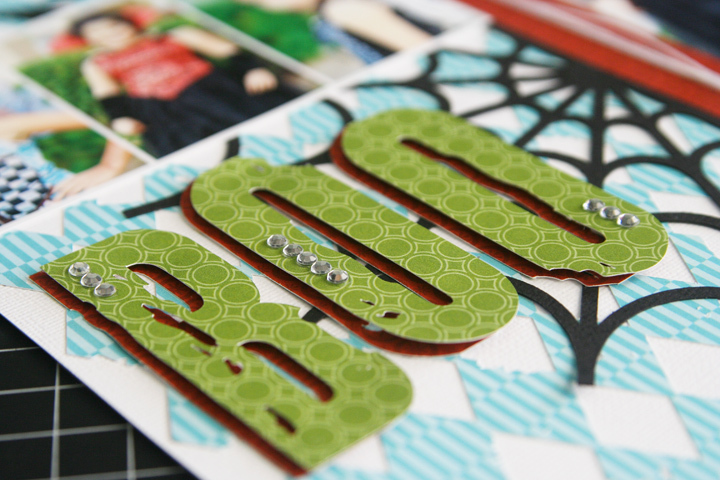 I cut my “BOO” title from both the green and red pattern papers, that I was using on other areas of the layout. I adhered the green letters on top of the red letters, using popdots, and shifting them a tiny bit to the side and down, so that some of the red letters were peeking out. Really like the use of your elements on this page, Kerri! Love that large spider web! I like the whole orientation of the page, too! Great colors, Laura! Love it! The colors are so fabulously out of the norm, and the spider web on the grunge argyle is terrific. I think I must pin this for future reference! Beautiful Laura simply love it!!!!!!!!!!!!!!!! Love what you did with the Spider Web… never thought to do that!!! you actually gave me hope … i had other ideas …. i put a shimmering light yellow under a 12×12 web …. then added couple of pixs and then a huge spider in the corner … it looked great in my mind, once i got it down on paper and all the pieces together, i was not so sure :( this gives me hope. THANK YOU !!!! as always kerri – i love your work! i wish all us scrap ladies can get together and play with our pages.